Ipe, sometimes misspelled as epi, is pronounced (ee-pay) and hails from Brazil. 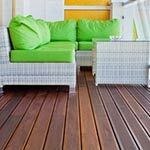 It is a very dense hardwood which makes it very durable in the face of harsh weather and heat. 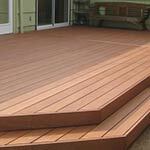 This deep brown wood is amongst the most popular choices for decks, flooring and fences. Ipe hardwood is at the same fire resistance level as steel and is naturally resistant to fungus and insects. It’s high density also makes it difficult to work. 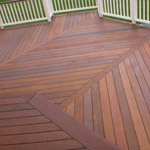 >>See our Ipe Product page for more details. This Southeast Asian native wood is excellent for building decks, boats and staircases. It is naturally decay, rot and insect resistant and is very similar to teak wood. The yellow-brown color stands out when placed outdoors among lush greenery. It is extremely easy to maintain and homeowners only need to reapply an oil-based finish once per year for the first two years then every other year. >>See our Yellow Balau product page for more details. Red Balau Batu is the epitome of strength and beauty. Its durability and cost make it one of the more popular choices for outdoor structures such as decks, boardwalks and bridges. The mahogany color is rich and vibrant and lasts for decades. The wood is easy to work with even though it has a high density. It is free of knots, holes and slivers. >>See our Red Balau product page for more details. This 100% clear grade hardwood is found throughout Southeast Asia. Just as the name implies, the color of the material is dark reddish-brown but can also be found in a light purplish-brown. It is mainly used to build furniture, cabinets, decks and floors. Dark Red Meranti does have a coarse surface but it can easily be weathered down to a smooth finish. An oil-based finish will keep this lumber looking vibrant and new. 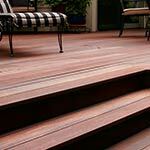 >>See our Dark Red Meranti product page for more details.